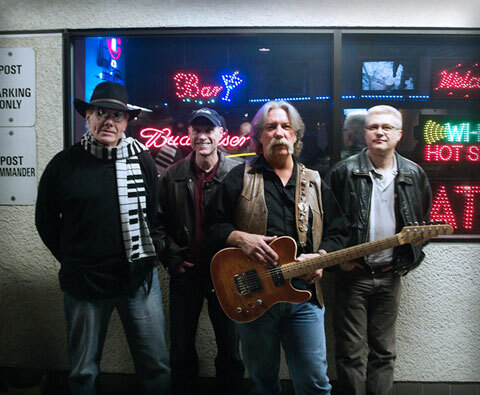 Inside Straight Blues Band, a popular band with Twin Cities and regional club audiences, plays blues and blues-rock in the Chicago, Texas, Memphis, Kansas City, St. Louis and New Orleans traditions. Tempered with solid jazz, funk and R&B influences, the result is a sound that is unique to Inside Straight; a sound that is truly a collection of its member's backgrounds and experiences. The core of the Inside Straight Blues Band is the quartet of Kurt Koehler on Guitar, Bill Swanson on Keys, Mark Zmuda on Bass, and Greg Mans on Drums. In addition to the quartet, Inside Straight offers both five and six piece ensembles with either an added saxophone player or a two horn section. The band's founder and leader, Kurt Koehler (Lead Vocals & Guitar) was born in Chicago in 1952. Kurt has been singing and playing the blues for over 40 years, from smooth uptown styles to contemporary rock-edged Texas styles to the down & dirty sounds of the Southside and Westside of Chicago. Kurt was also the owner, publisher, and editor of Twin Cities Blues News monthly which was in publication from 1996 to 2006. Kurt was inducted into the Minnesota Blues Hall of Fame in 2009 for literature. Mark Zmuda has been playing the bass since the mid-1960s with a strong background in blues, funk, and the early rock & roll bands in the Twin Cities. Greg Mans on drums has a long history of work with many Twin Cities bands including Cold Front. "Brother" Bill Swanson on keys and vocals has over 45 years experience as a professional musician playing with bands in the Twin Cities including the Phase and the Checkers. Both five a six piece ensembles often feature Merlin “Bronco” Brunkow on saxophones. Bronco has played over the years with local favorites such as Willie Murphy, Doug Maynard, Joe Juliano, Down Right Tight, The Big Wu, and many others. Also frequently appearing with Inside Straight are saxophone players Layne Bender (The Good, the Bad, & the Funky); Brian “Zoot” Simonds (Scotty Miller; Mick Sterling & The Stud Brothers); Ward Davies (Checkers; Back Alley Blues Band); trumpet player Scott Snyder (Mick Sterling & The Stud Brothers; The Big Wu; Willie Murphy, Irresistibles), and Rand Evenson on trombone (Power of Ten). Inside Straight has shared stages with artists such as Jimmy Rogers, Tab Benoit, James Cotton, Mojo Buford, Long John Hunter, Big Walter Smith, Roomful of Blues, Rod Piazza, Son Seals, Delbert McClinton, John Mayall, Magic Slim, Ronnie Earl, Phillip Walker, W.C. Clark, and Rare Earth, to name but a few. Inside Straight has played stages at the Bayfront Blues Festival, Duluth , MN, the Fargo Blues Fest, Fargo, ND, the Minnesota Blues Festival, New Ulm, MN, the Chippewa Valley Blues Festival, Eau Claire, WI, Cedarfest in Minneapolis, the Ribs & Blues Fest in St. Paul, MN, and the Pine River Blues Festival, Pine River, MN.